From the moment I first picked up this book, I knew I was walking into something special. After my experience with her novels The Mad Scientist’s Daughter and Our Lady of the Ice, Cassandra Rose Clarke’s name has pretty much become synonymous for me with some very cool ideas in sci-fi, and she has not disappointed me yet. Star’s End, I am happy to say, is another strong entry into the genre. And while it’s true that I did not quite fall head over heels for it like with her previous novels, I nevertheless devoured the story like there was no tomorrow. 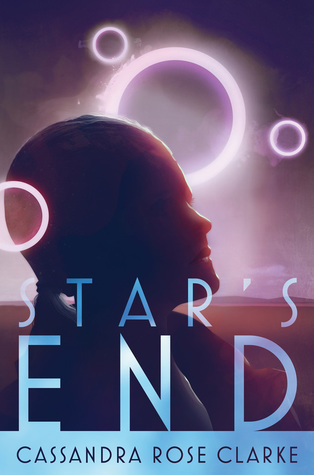 Described as a space opera which takes place in the far-flung future, Star’s End follows a young woman named Esme Coromina, heir to her father Philip’s vast corporate empire consisting of four terraformed moons that orbit one giant gaseous planet. Together, the moons are known as the Four Sisters—and perhaps not so coincidentally, Philip also has four daughters. Of his children though, only Esme, the eldest, is in a position to succeed him and take over the company when he dies; the three younger sisters have long turned their backs on him and abandoned the family business, due to a falling out long ago caused by something terrible Philip did. Esme was the only one who stayed, partly out of ambition and partly because she plans on changing things for the better once she inherits the Coromina Group. What follows is narrative that alternates back and forth between past and present, exploring the events that led up to Philip’s heinous act that drove Esme’s sisters away. But the biggest shock to our protagonist comes at the start of this book—her 300-year-old father, whom she has always thought of all-powerful and invincible, is dying. Afflicted with a fatal disease that not even his rejuvenation treatments can cure, Philip tells Esme that he probably has at most six months to live, but before he dies, he would like to see all his daughters one last time. Esme, skeptical of her father’s reasons for this request, agrees to help him regardless, though deep down, she knows the real difficulty behind his dying wish is whether or not she can even convince her sisters to come home. When they left, the three of them made it very clear that they wanted no more to do with Philip Coromina or their eldest sister—for in their eyes, by staying by their father and his company, Esme had betrayed all of them too. As a result, Esme finds herself in a rather awkward and painful situation. It’s this that makes me feel so deeply for her character, and makes me want to applaud the author for once again setting up such a compelling and emotional premise. Tracking down her sisters one by one, Esme must confront her guilt and come to terms with her past failings in this heartbreaking tale. In a lot of ways, this makes Star’s End a lot less like your traditional space opera novel, and more like your familial drama about love and redemption. In fact, it makes me think that the publisher description is actually a little misleading, suggesting that there’s a lot more suspense in this story when there really is none. Sure, there are indeed the promised “sinister aspects” of the Coromina Group involving its work with alien DNA, not to mention the overall mystery of the “big bad thing” that Philip did—but when answers do come, it is not a shock, nor are Esme’s next moves really in question. Because of the way Star’s End is structured, i.e. alternating between the past and the present timeline, nothing that happens is really a surprise, though ultimately it might not matter so much since the novel’s strengths are clearly in the character building and in the poignancy of Esme’s quest. Perhaps this is also why Star’s End reminded me so much of The Mad Scientist’s Daughter. While on the surface the two stories have very little in common with each other, both are excellent in providing a deep analysis and portrayal of their main characters. Almost everything else fades into the background as Esme takes center stage in Star’s End, much like how the plot in The Mad Scientist’s Daughter took a backseat while Cat’s personality and her relationship with Finn came to the forefront. This, in my opinion, is where Cassandra Rose Clarke’s writing really shines. When it comes to the delineation of her protagonists, she is an artist; she’ll take apart a character’s entire life, deconstructing their past and present to show how their experiences influence their decision making and shape them as a person. This kind of in-depth character study is exactly we get to see in Star’s End with Esme. Still, there were a few hiccups. The first time we jumped from the present timeline back to the past, I was really jarred by the change from third-person to first-person narrative mode, and unfortunately, I never truly got used to the switching. As a result, I always found myself feeling more sympathy for and in tune with “past” Esme, especially since older “present” Esme sometimes felt wishy-washy and inconsistent. One moment, she would be preening in response to her father’s praise and proud that she pleased him, but the next she would be flushing with shame if someone else complimented her on the exact same thing by comparing her to Philip. I was also frustrated that Esme didn’t stand up for herself more, considering how her heart was always in the right place. Given how much of the past was outside her control, I didn’t understand why Esme had to be so hard on herself either, and thought that a lot of her sisters’ treatment of her was grossly unfair. Minor as they were, some of these flaws were admittedly distracting enough that I felt the need to rate this one slightly lower than the author’s other novels I’ve read in the past. BUT! In spite of that, I still want to make it clear—I had a really good time with Star’s End. This book was a powerful and enjoyable read, and even though it wasn’t exactly what I expected, I am in no way disappointed with the way things turned out. If anything, it just reaffirms Cassandra Rose Clarke as a must-read author; I honestly can’t wait to see what she’ll surprise me with next. Awesome! They’ve published some great SFF in the short time they’ve been active so far! I have a great weakness for stories about familial drama, love, and redemption…sure, they’re not usually set in space, but I think it could work! 😀 Esme sounds like a really sympathetic protagonist and despite your issues with this one I’m excited to pick it up. Even if it was a bit underwhelming, it *is* still a standalone, so I can’t really resist! Time jumps can be tricky, and they don’t always work for me…but I think when done well, they can really add to the story! Space opera and far future usually work for me, or at the very least get me to take a look. Sounds like she really drills down into her protag and the characters in general, which is nice if you like character- centered tales (I do). This sounds like an author to watch. I agree, this wasn’t my favorite CRC book, but I still loved it. She does have a way of getting into the fine details of characterization that you just don’t see every where. I don’t know about this one, I’m not sure it really appeals to me. I do fancy reading this author but just not maybe this one. I neeeed to read this. And Our Lady of the Ice.